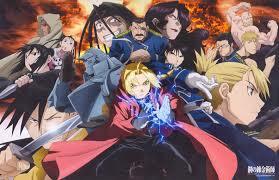 Fullmetal Alchemist: Brotherhood follows the adventures of Edward Elric, a State Alchemist employed by the military of Amestris, and Alphonse, his younger brother. After an aborted attempt to resurrect their mother through an illegal form of alchemy, the pair finds themselves on the brink of death. As payment for their folly, Ed loses his left leg, and Alphonse his entire body. When the dust settles, they begin to seek a way to restore themselves to normal, and in the process uncover a conspiracy that threatens the existence of the entire nation. Over the course of their travels, they encounter a group of beings known as homunculi, each of whom is named after one of the Seven Deadly Sins. While all were created by another older homunculus, known as Father, the circumstances of their “births” vary. Pride, Sloth, Envy, Gluttony, Lust, and the original Greed were each artificial vessels formed by Father and imbued with the power of a Philosopher’s Stone. Wrath and the second Greed (inhabiting the body of a prince named Ling), however, were originally fully human. Both were similarly injected with a Philosopher’s Stone, and consequently became the embodiment of a particular emotion once belonging to Father. The existence of these beings within the mythos of the series raises philosophical questions: Can we consider them to be persons? If so, should we consider Wrath and/or Greed to have a greater degree of personhood than the others? And how do we even evaluate their personhood over against that of Gluttony or Lust or Sloth? To be fair, these questions aren’t any different than those that have been applied to the contemporary fields of artificial intelligence and robotics. What makes a person? Can people be created through artificial means? What exactly constitutes “artificial means” anyway? And although such issues are consistently approached through the lenses of various Western systems of thought, ranging from the “objectively” scientific to the “subjectively” religious, it is only recently that non-Western (i.e., Buddhist, Hindu, Jain, etc.) philosophies have begun to find a place in these dialogues. Yet, regardless of the foundation from which discussions of bioethics might be derived, the fact remains that neither religion nor philosophy provides any easy answers. The first, form, was believed to encompass the physical body of an entity, while sensation referred to the responses to physical stimuli, typically registered through one or more of the five senses. Recognition, or perception, stemmed from these responses and necessarily allowed for identification of the external stimulus. Mental formations were largely linked to the emotions or thoughts and actions that arose from these encounters, and self-consciousness emerged when one recognized the existence of each of the previous factors (Rupert Gethin, The Foundations of Buddhism, 135-136). If we are to accept these as potential standards for individual personhood, then at least two of the homunculi would seem to qualify as persons. Although both Sloth and Gluttony are too dim-witted to actively consider their existence, and Lust, Pride, and Envy are largely one-dimensional, Wrath and Greed are slightly more accessible. Wrath was raised from childhood to compete for the throne of Amestris, a warrior among warriors trained in combat, military strategy, and countless other skills required of a competent head-of-state. He had rivals. He had goals. He knew pain. And now, as the Fuhrer, he has a family, a human wife and a child. We later learn that the latter is none other than the homunculus Pride, but Wrath himself states that he willingly chose his wife to be his partner. So even if we refuse to believe him, we’re still led to believe that he at least knows how to fake humanity. How else could a homunculus have established a reputation as a benevolent ruler over the course of roughly forty years in the public eye? In other words, we see that Wrath possesses even the most troublesome of the skandha: mental formation and self-consciousness. His true emotions might be limited by ignorance or a sheer inability to empathize, but they exist nonetheless. His actions might be guided by a desire or drive to fulfill Father’s plan for the country, but they are guided by deliberate intentions nonetheless. In much the same way, Wrath’s consciousness emerges in relation to his understanding of and interactions with Father, the other homunculi, humanity, and the world, as a whole. But this isn’t any different from the way in which the average human consciousness is understood in traditional Buddhist thought. It is wholly dependent upon the form, sensation, recognition, and mental formations that arise through daily encounters with any given object. Greed surpasses these qualifications. In both of his incarnations, Greed abandons Father and the other homunculi and turns away from the plan for which he was created. He wants power, wealth, and anything else necessary to bring the world under his control. His avarice even extends to other people, including a group of subordinates whom he seems to have considered friends. As a result, Greed finds himself incapable of remaining subservient to anyone else, human or homunculus. Interestingly, it’s friendship that actually provides the final push for Greed/Ling to rebel against Father a second time. When he remembers that Father ordered the extermination of his followers, Greed/Ling snaps and escapes into the wilderness. He later joins Edward Elric and fights against the homunculi, partly out of a desire for vengeance. Thus, whether we consider his attitude toward others to be indicative of true friendship or merely a form of patronization extending from his desire for control, we see that Greed exhibits something more akin to genuine compassion than Wrath (let alone the rest of his brethren). But in spite of these examples, any attempt to base personhood on possession of the five skandha is inherently flawed. According to Buddhist thought, they are not unique to humankind. Every sentient being, regardless of form, must be comprised of the five functions. Were they instead absent, nothing would connect beings across subsequent rebirths. There would be no such thing as a past life. To argue that personhood is contingent upon the skandha, then, we must be willing to accept that it cannot be limited to humans alone. All animals, demigods, demons, and ghosts throughout the realms of samsara would necessarily have varying degrees of personhood, not unlike Gluttony and Greed. To some of us, though, such a thought has the potential to border on blasphemy. We might condemn the shooting of a captive gorilla to save a human child, but comparatively few Americans (or Europeans) spare a second thought for the widespread slaughter of poultry or cattle. In the West, certain animals are food, not persons. And even when animals are not food, they still are not persons. So the question becomes: How do we reconcile “non-Western” beliefs with long-ingrained “Western” thought? Again, there is no easy answer. Some systems can never be fully reconciled with one another. Questions of life and intelligence and personhood are open-ended, capable of generating only continued dialogue and not final answers. But as these issues become ever more relevant in an increasingly technological and interconnected world, we find ourselves forced to face differing views on a near-daily basis. And that’s the beauty of it. To embrace the dialogue is to recognize the differences that so often separate us. To acknowledge how and why we each approach these issues in a given way, and to maybe inch that much closer to true understanding. It might not give us a solid route to defining personhood, but it’s not a bad start. Darian Shump is a rising M.A. in Religion at Florida State University. His research primarily focuses on issues of historical memory and ethnic identity in China and Japan, but he’s recently developed an interest in applying early Buddhist philosophy to American/Japanese comics.